How To Grow Potatoes in the UK | Bags, Beds or The Ground! 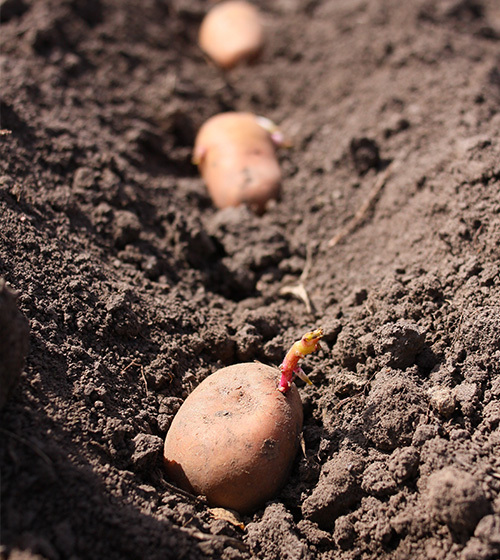 You might be a little confused about the details of planting your new potato crop. But don’t fear, use this useful table to decide which variety to plant, when to plant it, how to separate the seeds and rows, and when the harvest will be ready to eat. The reason that seed potatoes are sold is that they are grown at high altitudes to cut down any chance of disease-carrying spuds. There are fewer insects at high altitudes, and so this means less disease. It is OK to use shop bought potatoes in the first year but if you store them and use them for the second year the chance of them carrying disease is far higher than it would be if you used second-year seed potatoes. During the production of potatoes, it is essential to select the best variety that suite your area. Potatoes are the best crop to grow on newly broken grassland or wasteland, earthing up and the dense leaf canopy helps clean up land. Potatoes should not be produced on a plot that has had potatoes on it in the previous two years. They can do well in most soil types, for example, I have full clay land entirely, and mine have flourished, not only that I am told that they will help break up the earth. Potatoes should be planted out after the danger of frost has gone, usually early Summer. They should be planted at about 10-12.5 cm down and 30-37 cm apart with 60-70c m between each row. During planting the seeds can be placed on the ground with the sprouts facing upwards. He should be taken good care of not to break them. Ideally when planting the holes that you plant them in (also known as drills) should be lined then filled with sieved manure, compost or peat. No, it’s not a swear word, chitting means getting green shoots coming from your potatoes ready for planting out.during chitting the potato seed are kept in darkness for about two weeks. During this period the seed can be dusted with wood ash to prevent them from being attacked by the pest. The potato seeds sprout out on the eyes. Ideally, you should let the green shoots grow to be about 1.5 – 3 cm tall. There are many options for planting your potatoes, and they can depend on your soil type and the environment you live in. *Make sure the soil hasn’t had potatoes in it for 2 years running, as it can lead to disease. A slightly acidic soil is definitely preferred, you can add sulfur to alkaline soil to make it more acidic which will maximise the yield. It’s advised that you prepare the planting area a few months in advance, to allow the soil to settle slightly before planting. You should remove all of the weeds, and dig through the soil quite deep, removing any rocks or large stones. You should mix in some good manure or other organic matter, ideally with a high potash content. How to plant potatoes in the ground? This process involves creating mounds or hilled rows, creating shallow trenches for the potato seeds to lay in. Dig your trenches and separate the seeds using the specifications in the table below. When the new shoots reach a height of between 25cm and 31cm tall, push soil against the plants from the soil between the rows, making sure to bury the stems halfway. Repeat throughout the plants growing season. How to plant potatoes in bags? 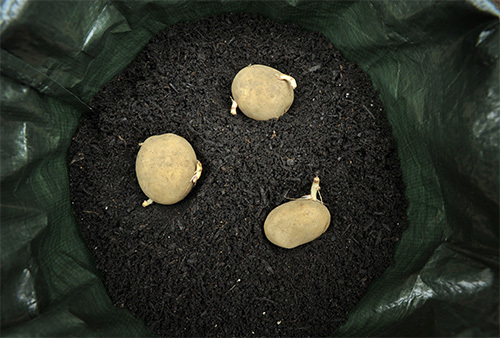 Using grow bags can be a fantastic way to grow your new potatoes. First add a small layer of compost into the bottom of the bag, then add 3 – 4 seed potatoes on top, followed by another layer of soil. As the plants grow, continue to add more soil until you have filled the grow bag. Harvesting is really easy, simply tip the bag upside down! How to plant potatoes in a raised bed? Add compost mixed soil to half fill your raised bed, then space the seed potatoes roughly 30cm apart in an even grid, burying them about 8cm deep. Like the other methods, continue to add soil as the plants grow until the bed is completely filled. Harvesting from the raised beds can be made much easier by removing the sides. The raised bed growing technique often provides the best crop of potatoes. How to plant potatoes in pots? It is possible to grow potatoes in pots, however you must give them the required space, so you will need various pots for a good harvest. Like the other methods, add a small layer of soil to the bottom, bury the potatoes, cover with soil and keep topping the level up as they grow. Harvest by emptying the pot. How to plant potatoes on your balcony? If you’ve got limited space on a balcony, then the pot or grow bag options from above would be a good choice for you, allowing you to grow a small amount of potatoes. How to plant potatoes in a bucket? Simply use the methods mentioned above for growing out of a grow bag or pot. Not much to do with potatoes really, they are half hardy, so the young growths will need protection from frosts either draw up some soil around them or put some straw on them, removing the mulch at a later date to ensure that they don’t go moldy. Water in dry weather, especially when the tubers have started to grow. The only other thing to do is to earth up, there are different schools of thought here, but I think that its fine to earth up in one go rather than gradually. Earthing up means to move soil around the base of the plants to protect them, this is done when the plants are about 22 cm tall. Break up the ground between the rows with a fork and remove all the weeds, then bring it up around the stem in a tent-like a shape up to about 15cm tall. Weed control should be done regularly. The weed competes for nutrients with a plant which lowers the quality of the crop. They also provide breeding sites for pest which attack the pants. Disease control should also be carried out to ensure high quality and quantity potatoes. Here are some of the common requests in regards to growing your own potatoes. When to plant potatoes for Autumn / Fall Harvest? You will want to plant them in early August, using the Second Crop varieties, which should be ready to harvest after around 11 weeks. How do you know if your potatoes are ready to harvest? For new potatoes wait until the flowers have dropped off, you can wait for about a week after but it depends on the variety. When the potatoes are ready, you can lift them using a fork carefully out of the trench. Ensure that you do get all of the tubers out when raising them as you could end up leaving a nasty disease in your soil. They should be harvested during the dry season to ease raising of the tubers. Anything you dig up after this will be known as second earliest, and until the leaves go brown and wither your potatoes will still be growing. To harvest potatoes for growing next year, wait until they have stopped growing. Cut off the top plants and wait for about two weeks. Lift the roots out and let the potatoes dry for several hours. Place in a dry wooden box or a potato clamp (link to making a potato clamp), ensuring they stay frost free and you should be able to use them next spring. How to store your potatoes after harvest? After harvesting, potatoes should be stored in a cool and dry room, where they can last up to 6 months depending on the variety. You can increase the chances of your potatoes lasting by reducing the water you give the plants 2 weeks before you harvest them. You should also wait until the plants have gone completely brown and died off before harvesting. At this point you should wash the potatoes, remove any green bits, and if possible add them to a warm and humid room for a week after harvest, which toughens the skin. White potatoes are typically called Irish potatoes, simply because they were the main variety grown in Ireland in the early 19th century, and are also associated with the Great Irish Potato Famine. What does Earthing Up mean? 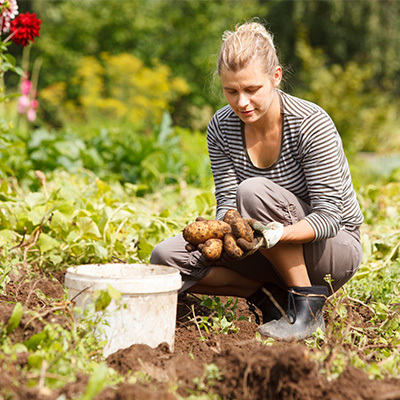 Earthing up is often known as hilling or ridging, and it’s the process of pilling up the soil around the base of the potato plant. How to grow a potato from a potato? If you see a sprout on an existing potato, you can cut that part off and plant it, and it will form a crop of new potatoes. What does Hilling potatoes mean? This is the same meaning as earthing up or ridging (see above). How tall do potato plants grow? They grow between 20cm and 31cm in height.